You're sitting in a multiple deck game with the option of soft doubling allowed. 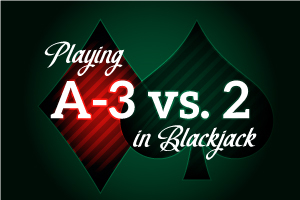 You're dealt an Ace and a three, which affords you the flexibility of having 4 or 14 to start with, while the dealer has flipped a two as his upcard. At this point you're in a situation where you have to decide between two prospective courses of action - either hitting or doubling. What are you going to do? The answer here is not to double. This is a hitting situation. If you follow Basic Strategy, you know that playing against the two is a very tricky scenario. That's because the dealer is likely to make a pretty good hand. Indeed, he'd have to draw two straight ten-value cards to bust. When the dealer has a two for an upcard, there is a very good chance for him to make a pat (standing) hand for himself. In fact, there is a better than even chance (51%) that he will achieve 18 or better. If you took one hit to this hand in a doubling down situation, you would lose about 3.5% per hundred hands. It makes sense to be able to make a hand by taking additional cards if necessary, as evidenced by the fact that when you DO NOT double, you will achieve a positive expectation of about 2-1/2%. The obvious rule of thumb here is that if one option yields negative results, while another yields positive return, you go with the option which yields a POSITIVE return. That's why we hit.